The newly appointed U.S. Secretary of State Rex Tillerson is quickly mobilizing government resources to increase scrutiny and implement tougher screening procedures for applicants who are applying for a U.S. visa or other immigration benefit at U.S. Consular posts and Embassies abroad. Reuters has reported that Secretary Tillerson has sent a series of internal cables (four in total) to consulates and embassies abroad instructing them of new measures to increase vetting of visa applicants (both immigrant and non-immigrant). These cables are as follows: (1) Cable 23338 entitled “Guidance to Visa-Issuing Posts” issued on March 10, 2017; (2) Cable 24324 entitled “Implementing Immediate Heightened Screening and Vetting of Visa Applications” issued March 15, 2017; (3) Cable 24800 entitled “Halt Implementation” of President Trump’s new travel ban due to a temporary restraining order by a federal court, issued on March 16, 2017; and finally (4) Cable 25814 entitled “Implementing Immediate Heightened Screening and Vetting of Visa Applications” issued March 17, 2017. In these cables, Tillerson has directed U.S. consulates and embassies to specifically identify population risks that warrant “increased scrutiny” and to implement tougher screening procedures for this particular group of people. Applicants who fall into one of the identifiable population groups will be subjected to a higher-level security screening. The cable does not identify whether embassies will be coordinating to provide a uniform standard for identifying populations who pose a security risk. This is a serious cause for concern, since U.S. embassies will likely vary in how they assess which groups pose a security risk. In addition, as part of these measures, the Secretary has ordered a mandatory social media check for all applicants who have ever visited or been present in any territory that is controlled by the Islamic State. Previously, social media screening was not a part of the regular screening process for U.S. visa applicants, however this screening process has always been a discretionary measure. In addition, the cables provided instructions for the implementation of President Trump’s newly revised executive order on immigration which sought to temporarily bar the admission of foreign nationals from Syria, Libya, Sudan, Somalia, Iran, and Yemen, as well as Syrian refugees, including mandatory enhanced visa screening procedures. Several of these cables were quickly retracted by the Secretary of State after a federal judge from the state of Hawaii issued a Temporary Restraining Order blocking Trump’s embattled executive order from proceeding as planned. The Trump administration had envisioned strict new guidelines for vetting U.S. visa applicants, and this vision was reflected in Tillerson’s cables. These cables are also likely to raise serious legal challenges and resistance from advocates and lawmakers if it is found that these new vetting procedures result in racial profiling or discrimination of applicants on the basis of nationality or religion, rather than a well-founded threat that the individual poses a legitimate national security risk. Questions have not been immediately answered by the Department of State and OMB regarding these cables since they were meant to be used internally, and not made publicly available. Consular officials have stated that the majority of the guidance outlined in the March 17 cable has not deviated from the guidance provided by previous administrations, particularly because U.S. visa vetting procedures are already rigorous. It is unlikely that the Department will answer questions regarding these cables since the vetting of visa applicants is largely confidential. 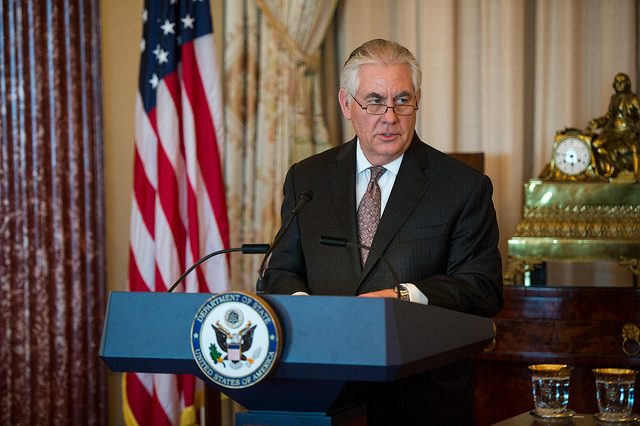 Among the instructions that were retracted by Tillerson due to the Temporary Restraining Order currently in place that has been prevented the travel ban from being enforced were sets of questions for individuals from Iran, Libya, Somalia, Sudan, Syria and Yemen, as well as other countries, asking where applicants had lived, traveled, and worked for the past 15 years, and prior passport numbers, phone numbers, email addresses, and social media handles used in the previous 5 years. The March 16 and 17 cables have specifically directed consular officials not to ask these questions in lieu of the court order. Once posts have documented these population sets, posts are required to direct adjudicating consular officers to attempt to identify individual applicants that fall within the population set during the course of a consular visa interview. If the applicant is otherwise eligible for a visa (including overcoming INA 214(b) for nonimmigrant visa applicants), the interviewing consular officer should consider sending a discretionary Donkey Security Advisory Opinion (SAO) request. — All email addresses and social media handles used by the applicant in the last five years. **NOTE: Item 7 above has since been retracted. Consular Chiefs must immediately convene post’s law enforcement and intelligence community partners under the auspices of existing Visa Viper or Law Enforcement Working Groups, as appropriate. These working groups will develop a list of criteria identifying sets of post applicant populations warranting increased scrutiny. Once posts have documented these population sets, posts are required to direct adjudicating consular officers to attempt to identify individual applicants that fall within the population set during the course of a consular visa interview. If post determines the applicant may have ties to ISIS or other terrorist organizations or has ever been present in an ISIS-controlled territory, post must/must refer the applicant to the Fraud Prevention Unit for a mandatory social media review. 11. While the E.O. exempts nationals of Iraq from the travel suspension provisions of Section 2, the Presidential Memorandum and Sections 1(g) and Section 4 of the E.O. contemplate additional screening for Iraqi nationals in addition to the robust vetting already in place. an Iraqi national applying with an Iraqi passport, consular officers must consider whether the applicant was ever present in a territory at the time it was controlled by ISIS. If so, post must submit a Donkey Security Advisory Opinion (SAO) for these applicants, except those applying for an A/G/C-2/C-3/NATO visa. 13. In order to ensure that proper focus is given to each application, posts should generally not schedule more than 120 visa interviews per consular adjudicator/per day. Please that limiting scheduling may cause interview appointment backlogs to rise. If you have further questions about how these new vetting procedures may delay issuance of your U.S. visa please contact our office.